Ex library in protected plastic cover. Dustwrapper worn and stained. These two stories by Mrs Ewing are tales of family life. In the first, three children hilariously school and prepare themselved for every possible emergency they can imagine, only to be overtaken by the one eventuality that they had not thought of. 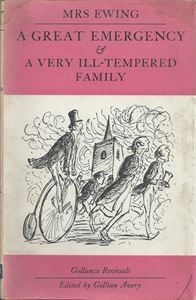 The title of the second, A Very Ill-Tempered Family, is perhaps a trifle exaggerated: the family quarrels seem little worse than those that occur in most families, but when one, which develops out of some private theatricals, threatens to become really serious, a change of heart averts a fearful disaster just in time.